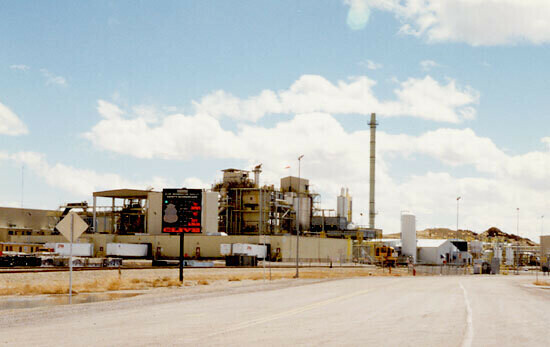 A $125 million hazardous waste incinerator built by USPCI, a division of Union Pacific railroad, in 1995, and one of the largest in the USA. It was closed and sold and partially disassembled around 2003. Designed to burn up to 130,000 tons of toxic chemical wastes per year, mostly from petroleum and chemical industries. Currently no treatment occurs at the facility; it is a storage and transfer site only. Owned by Clean Harbors, Inc., which owns another major chemical waste incinerator a few miles east, at Aragonite, and the disposal site a few miles to the north, at Grassy Mountain. Clean Harbors is the largest toxic waste disposal company in the USA, and operates other incinerators around the country, including a major one at Deer Park, TX. Clean Harbors started as a disposal company working to clean up Boston harbor in the 1970s. It acquired this plant when it bought Safety Kleen, the previous operator of this site, and the other two toxic waste facilities in the region. Safety Kleen bought the Clive incinerator from Laidlaw Environmental Services, the Canadian waste giant, which bought it from USPCI.